There once was a clown named Flimsy the Clown. He was much like any normal clown. He performed at carnivals and circuses. He lived with the other circus performers, he rode on the Merry-Go-Round during his break, and he certainly ate his fair share of peanuts and corndogs. He was a rather happy clown, until one fateful day! A careless patron spilled fruit punch on Flimsy's shoe. The careless patron didn't even apologize. He laughed at Flimsy's misfortune and carried on his way. Flimsy went back to his tent to try to clean the stain out, but found it impossible to return his shoes to their former glory! He took on the name Flimsy the Fiend and began hunting down any person drinking fruit punch at the circus grounds. No one escapes his fiendish plot for revenge! And he used to wear shoes... THAT WERE JUST LIKE THESE ONES! WooooOOOooooOo! Is the story true? 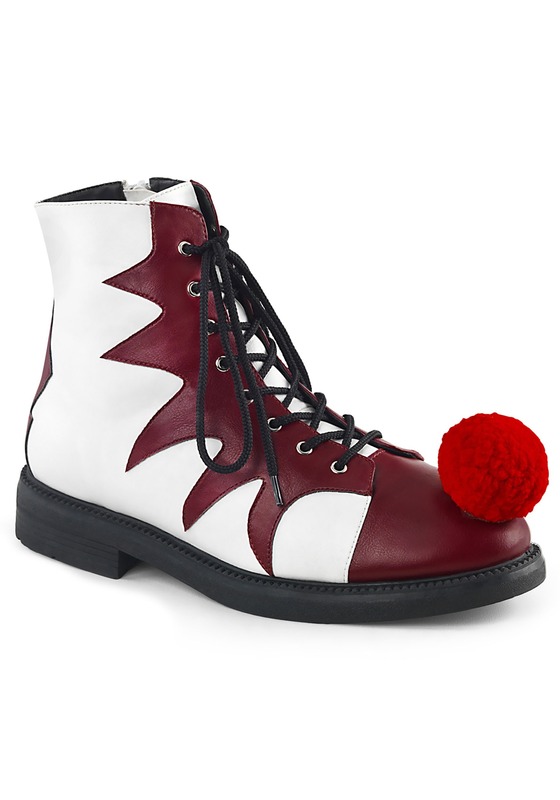 Nah, we made it up, but these evil clown shoes will let you bring your own terrorizing clown costume to life. They're white with a dark red front, which gives it a rather creepy look. Even the red fluffy tuft on the front can't make these shoes look like "happy" clown shoes. Just slip these clown shoes on your feet and you can bring Flimsy the Fiend (or another evil clown of your own creation) to life. Just make sure to pair it up with any of our other great clown accessories and a toy weapon to round out the look!